This photo was taken in late May 2012. The location was at a large downtown theater in Washington DC. The "Take it!" Came from the combination of images that all came together via direct viewing or by reflection. This is a photo that I really enjoy for it has a reflection of myself right in the middle of it all. 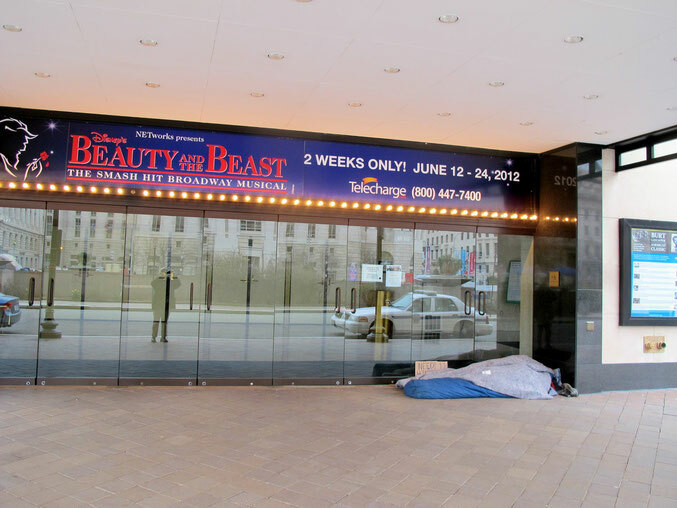 The name of the musical matched up with the sleeping homeless person and the police car sort of defy putting together any creative title. Thus, the selection of 'Self Portrait' as an easy way out. The After Take: This is a photo that I put aside to give myself some time to think about it. I am not certain it really needed any time, for it is just as word defying now as it was when I first looked at the print over a year ago. I hope you enjoy this thought provoker as much as I do. Definitely a good spot to catch some shut eye. Oh I'd love to see that broadway show. My wife is a huge Disney fan. She would have loved to catch that show. Its a long distance selfie!